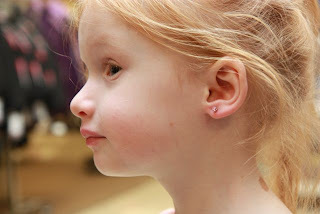 For over a year Miss J has been asking us to get her ears pierced. 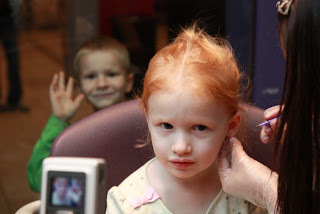 A few months ago we thought maybe we would do it, but a quick pinch to her ears and she decided that maybe she didn't want to. About a week ago she started asking again, and this time pinches had no effect. 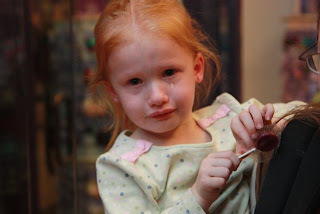 She still wanted them done! 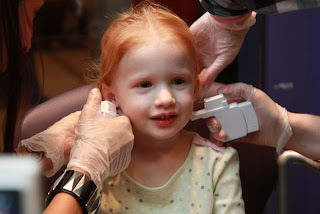 Given the timing of Christmas and then her birthday coming up soon too we thought we would go ahead and take her to have it done. then she got a bit nervous. We were all there to cheer her on. 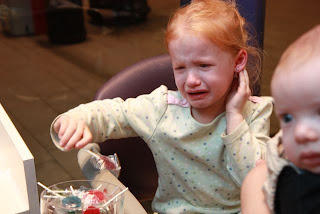 I guess it hurt worse than she expected. but not quite all better. On Wednesday right before Thanksgiving Rob was in one of those "welcome to the base" meetings and I was at home with all of the kids preparing for Thanksgiving when I got a call from him at about 10:10 AM "The meeting is ending with a free tour of the bone yard, it leaves at 11:00, want to come?" 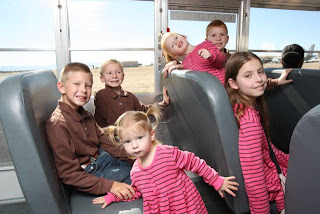 Knowing that this tour is a fairly expensive one (especially for a family our size) and that the kids would love getting to go I said "Ummmm.... Sure we can make it". Kids were all over and most of them fairly dirty from playing outside in the dirt or helping me with cooking. "Ok everyone, go get errand day clothes on and get ready to go! We need to be out the door in 10 minutes!" Amazingly no one asked "why" or "where are we going", without a word everyone flew into action and we were out the door in 10 minutes! Everyone even looked presentable! 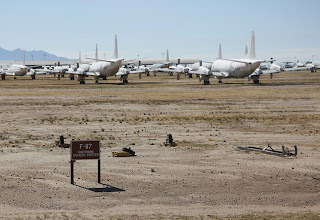 Oh, are you wondering what the bone yard is? Why we would be excited to visit it? 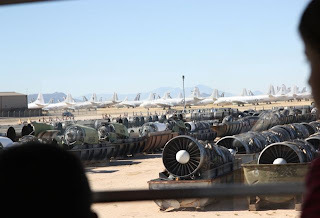 It is where the military stores all of their old planes or the ones that have been taken out of rotation for now. Acres of airplanes lined up, row after row. Yea, to say the kids were excited would be an understatement. We drive by parts of it regularly on base, but can't get in. This was our chance! 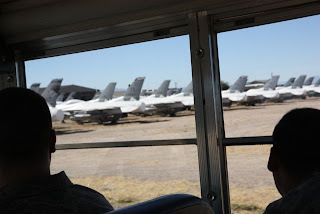 The kids loved seeing the rows of airplanes, helicopters, and even spare parts. 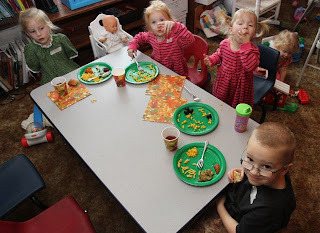 We had a wonderful Thanksgiving here. We had a slow morning and enjoyed our time together. Then we headed off to be with some friends right up the street. 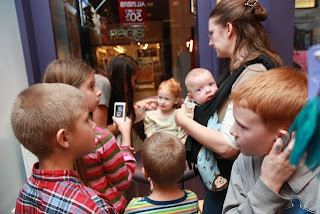 We had a fairly large group, but most were kids. 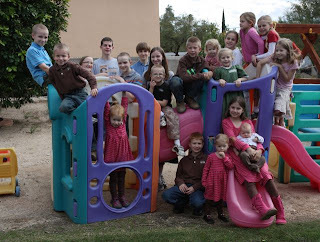 We had 20 kids, from just three families! 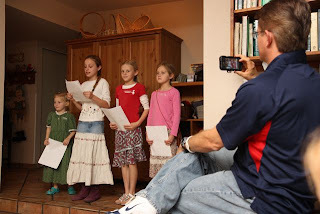 All of the kids had prepared speeches, songs or some sort of presentation. 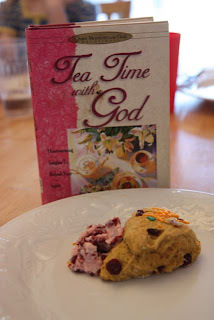 We had a wonderful feast and great time of fellowship. 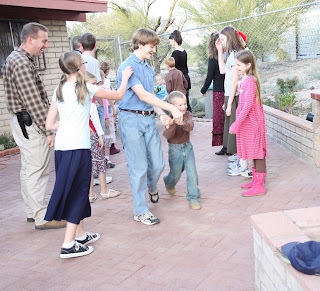 After our meal we enjoyed some English Country dancing. We have so much to be thankful for, this year has been such a busy one and we've had so many transitions happening the last few months. God has taken care of us and provided for us every step of the way. What a blessing to see that all come together in a relaxing morning spent in our wonderful new home and then going on to some great fellowship with new friends. All of which God provided in some amazing ways. Praise God from whom all blessings flow! 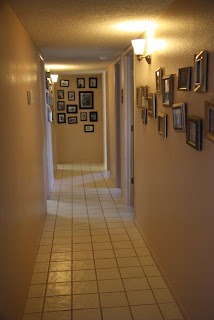 Now that we've been in the house for nearly two months I figure its about time I did a quick tour of some of the house. We are really enjoying this house, and are so thankful to our friends that helped us pick it out! Here is the living room. Since we have loads of kids living here, it looks like kids live here! We set up a doll area in the corner for the girls, they spend hours over there taking care of their babies and having tea parties. Mr. K likes to hang out with them over there too. 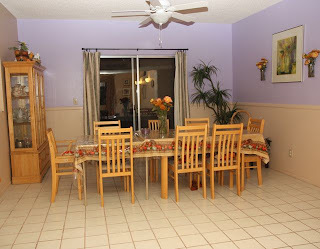 The dining room was the easiest to get moved into. We need to turn the china hutch to be next to the door. Miss E sewed up the table cloth for us! This is the first time we've really had a school room. 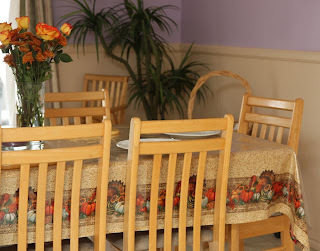 In the past it has always been a part of the living room or dining room. 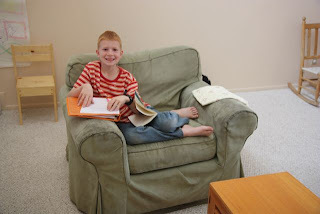 We're enjoying having a place set apart for school, but still in a main area of the house. I love having the couch in here so that we can cuddle and read together in here while little ones work on activities at the table. We spend quite a bit of time in here. 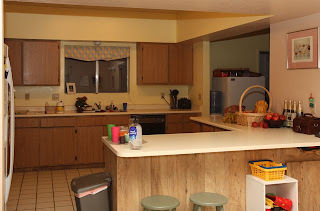 My kitchen is yellow again! I love it, though it does not show up well in the picture. Miss E and I are enjoying having plenty of counter space in here. I also love that there is a large laundry room off of the kitchen with plenty of space for one of our freezers! Down this hall you'll find the bedrooms, that I'm not quite ready to show you. Maybe after Christmas? There is still plenty of work to do to get us all settled in, but as you can see it is quite livable. 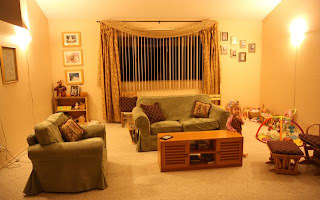 We are really enjoying the layout of the house, I think it is our favorite so far! 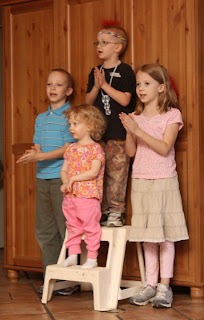 This blog was started to be a way for friends and family to keep up with our kids. 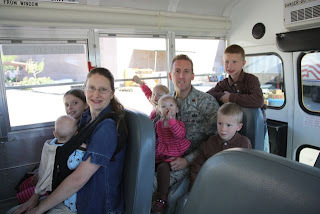 As I started putting more home management and large family living things on this blog I began thinking that I should have another blog for those sorts of things. Thanks for coming to Gabe's babes (and please continue to come! ), and I'm looking forward to seeing you over at my new blog! A while ago I received a pasta machine from my grandparents. I have fond memories of making pasta with grandma, mom, aunties and cousins. 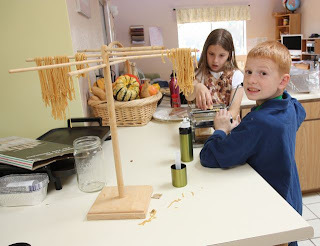 When Rob (who loves pasta) and Miss E saw it while unpacking they thought making pasta would be a great idea. Miss E and Mr. R worked on making noodles. 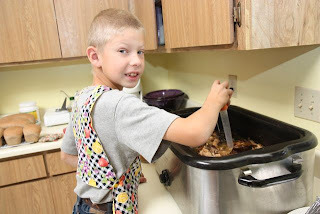 Mr. M helped a bit too after helping me transfer chicken broth into containers to freeze. 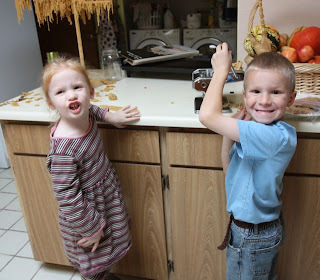 Once the big kids were done working on the pasta Mr. S and Miss J decided to get in on the action. We cooked the pasta up and put it in our soup for dinner. We've all heard of pack rats right? You know, people that can't seem to get rid of anything. Well, that is not the sort of pack rat I'm writing about. We have real live rodent pack rats here! They like to collect things and put them in dark places..... like under the hood of a car, and while there they may just chew up some wires! Mr. M's sharp eyes spotted one heading into our van, which made us realize we needed to do something about these pests sooner than later. We didn't want a bunch of traps in our yard as that would be a hazard to our little ones. The solution? Cats of course! 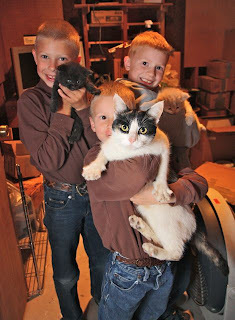 We have a friend with several cats/kittens, that are good little hunters, who offered us some of hers! Yay! 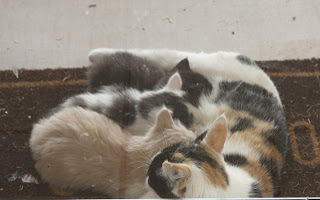 We ended up with a mama cat and her three kittens. 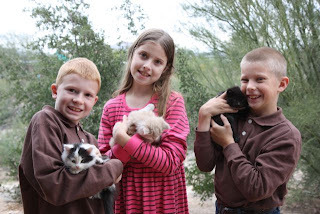 These cats are outside only cats and are here to work (though our children sure are enjoying them). 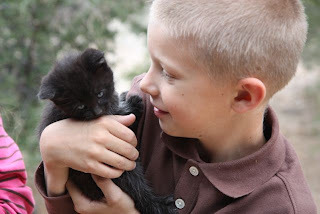 They all have food related names to help our kids remember that the cats are here to make snacks of pests around here, but may also become coyote snacks themselves. They have a place of shelter on our porch and will generally be safe there so we hope they will be with us for quite some time. It has continued to feel like summer here even though the calendar says it is fall. Slowly signs of fall have been creeping into the home. 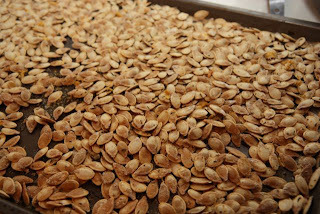 Like the pumpkin seeds that Mr. M roasted. He requested them, so I found a recipe for him and he did the rest. They are quite tasty. 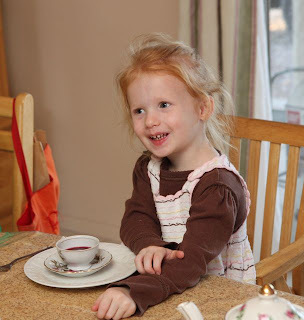 Miss E made Pumpkin cranberry scones and cranberry butter to have for our tea party. 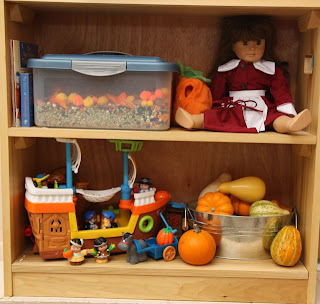 ...and our sensory bin is all ready for fall too! 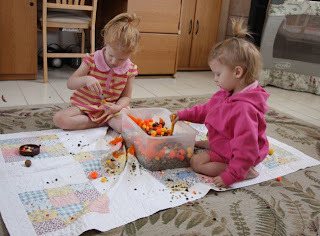 The table cloth the Miss E helped me sew is on the table and some other fall decor is out too! And the biggest sign of all? One morning this week we all awoke to a rather chilly house! 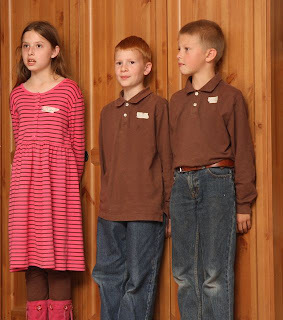 I scrambled to find fall clothes for the kids who were shivering in their summer clothes (I guess they've acclimated!). Fortunately I plan ahead and I had nearly everything all set and waiting to be needed! This week we are starting to feel like we are getting to our new "normal" around here. While we are still doing quite a bit of settling in we are also falling into a nice routine. Chores are getting done regularly now, which feels so good. 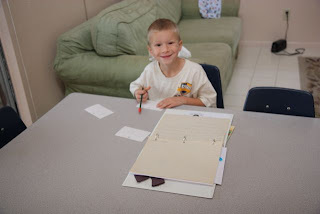 We've been doing school (as in grammar and math) regularly, though learning never takes a break around here. 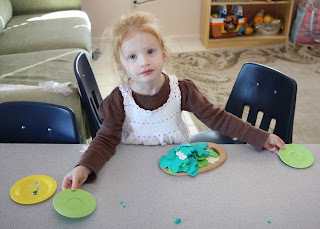 Little girls are getting to do "pre-school" activities regularly (play dough here). 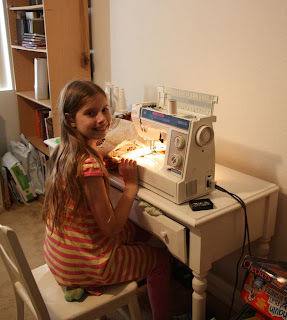 Miss E has started helping me sew (she is working on a tablecloth here). 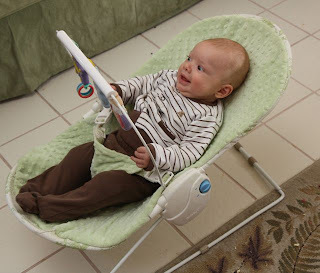 Mr. K is figuring out how to eat and sleep at regular times and even learning to put himself to sleep! It feels so good to be finding our normal, it gives sense a peace and calm to everyone. Our house is starting to feel like home! Happy Birthday Miss C- a very ducky day! 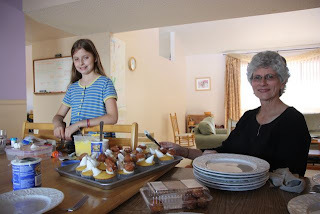 We celebrated Miss C's birthday this week-end while my dad and step-mom were in town. 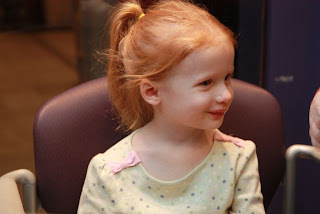 The week-end didn't quite go as expected with the three little ones getting sick, but we still had fun! 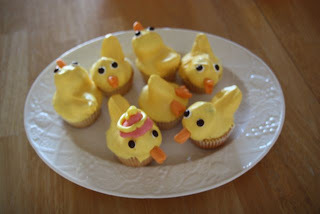 Miss C had requested Ducky cupcakes from the "What's New, Cupcake?" book. I was so excited to make them, but with a sick, fussy baby Grandma had to come to the rescue and put them together with Miss E.
By the time it was time to frost and decorate the little ones were sleeping so I was able to help. 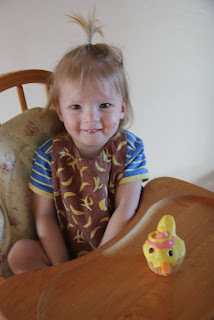 Miss E made the cute little pink hat for Miss C's ducky. 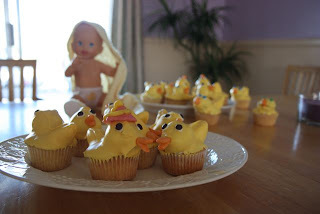 The ducky cupcakes went very well with the ducky bath time doll Miss C had been asking for. 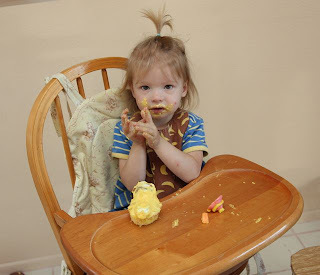 Despite being sick she managed to have some fun with her cupcake! I've been itching to get Miss C and Mr K back into cloth diapers but I had a couple of problems I needed to figure out before I could get that started. The first problem was that the movers lost the changing table. 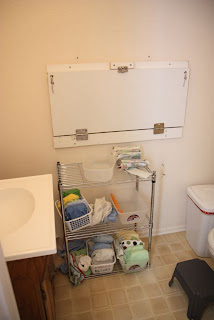 The next problem was that the best space for a changing station is too small for a changing table. What to do? A friend suggested a fold down changing table. Rob is so great, he made one for me! We were both just wanting to get it done, so he put it up without worrying too much about how it looked. In a few weeks we will get around to figuring out how to make it pretty. I've got some ideas, but I'd love to hear suggestions. The bathroom is off of the laundry room next to the kitchen. 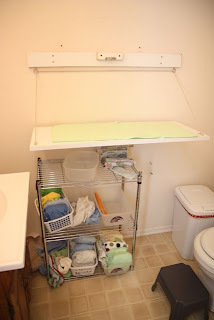 I don't want to spend much $$$, and I want it to be on the brighter side since the room is small and the cloth diapers will be out (brightly colored). 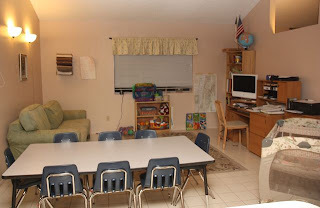 This is a room I'll be in regularly, I want it to look happy so I can look forward to coming in here!